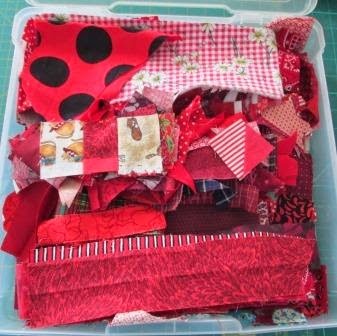 We have a new month for the Rainbow Scrap Challenge 2014 and the new colour is Red. I got a few sampler blocks done last month but had not posted. 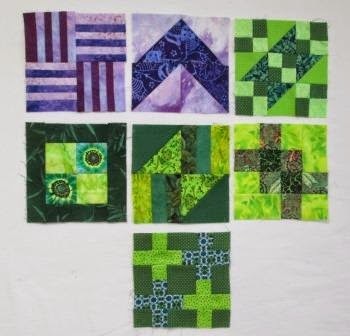 I finished my Purple blocks and got 5 green ones done for April. I still need Yellow sampler blocks from June. I hope this month I can get the sampler blocks all caught up. I still have to do 4 Green ones, 9 yellow and now 9 Red ones. I got out the Red scrap Box. It is one of the better sorted boxes. It is not over flowing but there is enough to play and have some fun. I did not have lots of sewing time today 1st son is in city finals for soccer, so I sat in the sun and got a little red myself. Yes sunburned. I got to finish this 8" spool block. 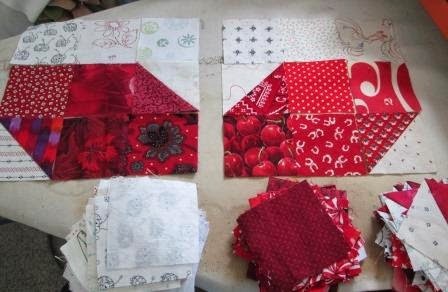 Next I sorted and cut and was preparing more red scraps. I am in need of 5 Sprout blocks. I was hopping Red would come up. 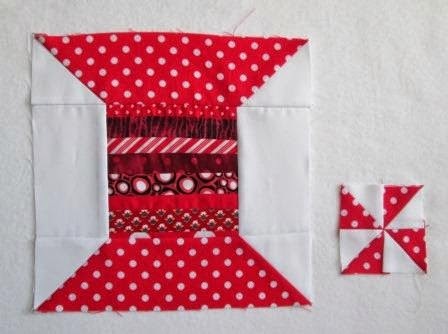 I need to get these Red blocks done and then I can think about how I want to finish my sprouts quilt. Last week some of the quilters doing the RSC14 showed off the mid way point of their work check it out Here. This week you can see what is up with Red at Soscrappy. Those polka dots just make me smile. Love the spool block! Good looking sprouts. Looking forward to seeing the finish. Wow how I love your colourfull quilts! Great start on red. I really like how your purple and green look together. You are a busy girl! I can't hope to catch up if I were to start now. Love your blocks. Keep us in the loop. We will sew RSC through you. Love your box of scraps. I too got a wee bit red this weekend - it is the color for the month after all! Sprouts are looking good.